Hypoxia tolerance and the intensity of systemic inflammatory response during endotoxemia were examined in newborn, prepubertal, and mature Wistar rats. 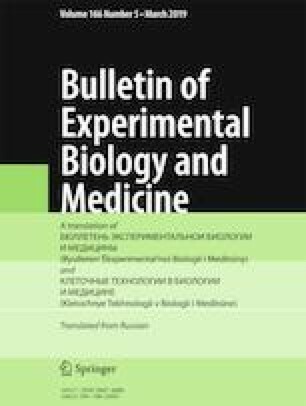 To assess the sensitivity to hypoxia, the rats were placed into a pressure chamber simulating an altitude of 11,500 m. The systemic inflammatory response was provoked by intraperitoneal injection of LPS from E. coli O26:B6. Serum concentrations of HIF-1α, neopterin, C-reactive protein, and endotoxin were measured. In histological sections of the liver, the area of necrosis was assessed. The smallest tolerance of the prepubertal males to hypoxia correlated with the greatest manifestations of hepatic inflammation and elevated endotoxin, neopterin, and C-reactive protein. Elevation of serum HIF-1α in 3 h after LPC injection was observed in only prepubertal rats. The data obtained should be taken into account during the development of therapeutic strategy for prepubertal children with infectious and inflammatory diseases. Eisenhut M. Neopterin in diagnosis and monitoring of infectious diseases. J. Biomark. 2013. ID 196432. doi: https://doi.org/10.1155/2013/196432. Esteban E, Ferrer R, Alsina L, Artigas A. Immunomodulation in sepsis: the role of endotoxin removal by polymyxin Bimmobilized cartridge. Mediators Inflamm. 2013. ID 507539. doi: https://doi.org/10.1155/2013/507539.